It’s no secret that I LOVE macarons. There’s really nothing else like them- crisp yet chewy and filled with the most delicious cremes and caramels. French macarons have found their way to the top of my favorite desserts list for life. And speaking of lists, Laduree has been on my list of New York spots to hit since before we arrived. I finally made it over there last week and despite the hour-long line, I enjoyed every last bite of the delicate pastries (of which I shared none with my husband-oops!). While all of the flavors that I tasted were amazing, my favorite was framboise (raspberry). xoxo! P.S. Check out this easy recipe for homemade macarons! yummyy!!! some co-workers just brought cheesecake back from NYC!! ohh how i love to travel! Love your blog by the way!! Super chic and fun! You know, I have yet to have ANY cheesecake in New York. Making it my mission this week. Thanks for the reminder! Mmm, those look so good… I heard rumors of a Laduree opening in NYC, good to hear that it’s possible to get quality macarons this side of France. Great post! In LA, my favorite places for macarons are Bottega Louie and Paulette. Both are traditional French patisseries and make very exquisite macarons. 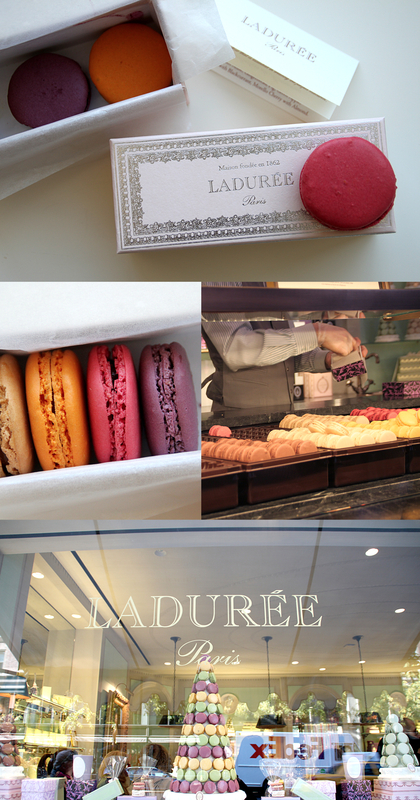 I never went to Laduree in Paris but I did have many a macaron while traveling through France and I have to say that both of the Los Angeles locations that I just mentioned could rival a native French macaron any day. I’m sure the Laduree will be wildly successful there! Tho I’m not their biggest fan, I brought some macaroons back home from Paris and my family didn’t like them!! I told them I had spent a lot of money on those and they were going to eat them and like them! Oh, so sad that your family didn’t like their macarons! I quite enjoyed mine, I have to admit. The wait was a bit outrageous but my patience was rewarded with a box full of almost too pretty to eat goodness. I adore these but I have to be make sure that I know when to put the pack down !